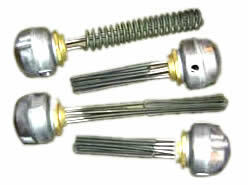 6kW Industrial Immersion Heater - PII6 - Process Heating Services Ltd.
Immersed length of 450mm or 18″. 125mm or 5″ inactive or cold end. 6.51w/cm² or 42w/in² watt density. Terminal box dimensions – 120mm diameter x 105mm height. 3 x Incoloy 800 (“a superior stainless steel”) 8mm diameter 2kW 60” elements. Complete with Tig welded incolloy 800 11″ thermowell. This will house any of our 11″ thermostats. On our stock 6kW industrial immersion heater we use 6″ cold or inactive ends by default in case our customers need to fit the heater vertically, allowing a little leeway for level drop within the tank. This extended cold end also prevents any issues of tunnel heating, which can be problematic if deep weld bosses are used. With a 2″ cold, an inch is lost into the screwplug, so only the first inch is really unheated. …or call Jamie on 01827 703228 to discuss your 6kW industrial immersion heater needs. Whilst the “Contacts” forms serve a purpose, there is no substitiute for a telephone conversation, perhaps supplemented with a photograph or two to jamie@nullprocessheatingservices.com. Everybody’s applications is different, and we take a pride in getting everything right first time. The best way to achieve this is through a two way discussion. We look forward to helping you address your requirements. A full description and explanation of the componet parts of a screwed immersion heater is available here on our blog. Also available is information about how best to choose an immersion heater for water, oil, and breweries. Also available is an informational entry about the process we go through when designing immersion heaters, generally. Jamie has provided a wealth of technical knowledge for us, solving a long standing problem that we had with our immersion heaters. That knowledge coupled with excellent service means that we would highly recommend Process Heating Services. AMAZING AMAZING RESPONSE,VERY POLITE,EXTREMELY HELPFUL, INFORMATIVE AND WENT BEYOND CALL OF DUTY TO HELP WITH MY QUERY WILL NO DOUBT TELL FRIENDS AND BUSINESS COLLEAGUES ABOUT THIS FIRM. I am 83 and half deaf. Jamie went out his way to help me when he didn’t have to. He didn’t even sell me anything, but he made sure I got sorted with another company. He is the bees knees. When I decided to replace the old heating elements on my vac form machine I was really stuck, where do you get elements for an old machine like mine that is not made any more?…and then I discovered PHS. What a brilliant firm. They not only discussed which would be the best elements to choose, they also custom made them to size to fit my machine. A first rate and very friendly efficient service. I would give these guys 10 stars! Thank you Tim & Jamie for all your help. The Process Heating Services Brewery?